The people who are known as Anglo-Saxons were immigrants from northern Germany and southern Scandinavia. This name is collectively applied to a group of farmer-warriors who lived in Britain thousands of years ago. These groups were made up of three tribes: – Angle, Saxon and Jute. Angle and Saxon were the largest group compared to Jute so this is how we use the word Anglo-Saxon. They made the very first attempt to invade Britain in the 4th century but were sent back by the Roman army. Years later, they came back around 450 A.D. when the ancient Romans left Britain. Most of them were farmers before they left their homes in Germany, the Netherlands and Denmark and sailed over to Britain. The first Anglo-Saxon king to rule England was Egbert and Harold II was the last king. The Anglo-Saxon period covers around 600 years. They took control most of Britain but they never conquered Scotland. Their buildings were simple, constructed mainly using timber with thatch for roofing. The language of Anglo-Saxons is also known as old English. It is somewhat related to German. Northumbria was the first kingdom of Anglo-Saxons that dominated Britain in the beginning of 600s. Mercia, Northumbria, Wessex, Kent and Anglia are the five main kingdoms of Anglo-Saxons. Each and every kingdom has its own royal family. The people who helped the king to rule the kingdom were thanes and bishops. They also had slaves. The word ‘England’ has been derived from the Saxon word ‘Angle-Land’. They made their own clothes out of natural materials. William the Conqueror, a Norman king ruled England after the end of the Anglo-Saxon rule in Britain. Declan, Tobin. " Fun Facts for Kids about Anglo-Saxons ." Easy Science for Kids, Apr 2019. Web. 25 Apr 2019. 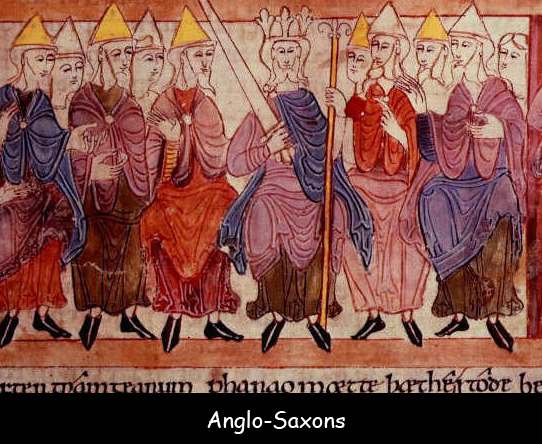 < https://easyscienceforkids.com/facts-about-anglo-saxons/ >.